Vend started in 2010 in New Zealand. Ever since it was founded, the company has managed to stay on top of industry trends. Nowadays their product remains one of the most user-friendly systems on the market. One of the reasons for this POS system’s popularity is the fact that it is entirely cloud-based. As a result, you can keep using it, even if you suddenly lose Internet access. This reliable and fully functional POS system works very well for businesses of all types and sizes. This POS solution’s versatility lies mostly with its solid design and integration, which is compatible with Macs, PCs and iPads. It can also operate with a wide range of in-store hardware, from receipt printers and bar code scanners to cash drawers. Vend’s team are constantly updating their products. As a result, the POS system’s front-end features are remarkably intuitive, while the back-end ones come with almost everything you would expect from a top-quality system. What is more, all that abundance sells at a reasonable price. The company has developed a remarkable inventory management system that has extensive list of integrations with third-party software. It also boasts an omni-channel sales approach with both in-store and online capabilities that make it a well-rounded retail management solution. Not surprisingly, Vend is a market leader, whose client network spans over 140 countries, and it has registered over 20,000 verified installations. To begin with, Vend offers a free plan which is a great choice for small retailers. All other subscriptions start with a free 30-day trial. 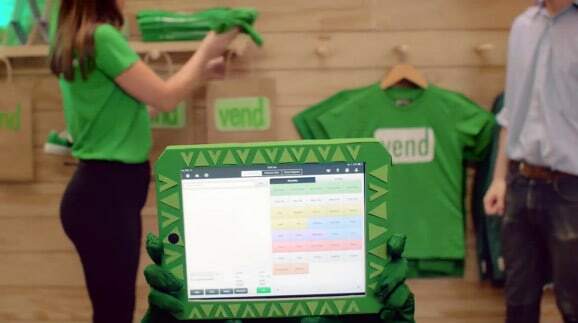 Unlike most other web-based POS services, Vend does not require the signing of a contract. Instead, you pay your subscription each month by credit card. You get a discount on the monthly price for all but the starter plan, if you pay for one year in advance. Premium Support is available with the Multi-Outlet plan. For an additional fee of $19 a month, you can have it with the Advanced plan as well. This plan includes personal set-up assistance, ongoing training, and phone support. If you need a more personalized option, you can take advantage of Vend’s Enterprise plan. Because Vend works entirely within your web browser, it has to be HTML5 compatible. If you happen to have a sudden network outage, all data is saved in the cache, which runs things locally. When you come back online, your sales re-sync automatically. Vend is a flexible, versatile solution for retail establishments of all sizes. There is no limit to the number of stores a business can have, so it is appropriate for small shops, large franchises, and everything in between. Its free version is suitable for very small businesses such as, for example, farmer’s market retailers. The company offers convenient packages to accommodate almost every type of business. One field where Vend appears to be slightly less popular is the food service industry, owing mostly to its lack of item modifiers for table management and tipping. When you sign up for a free trial and take a tour of the system, you’ll immediately notice that for your convenience each category is linked to its relevant page in the configuration dashboard. 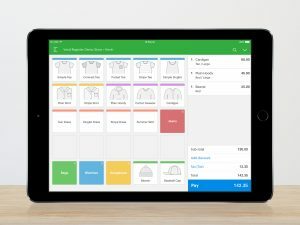 The system walks you through the processes of adding products and customers, customizing the register's quick keys, setting up taxes, and more. This is a great way to get to know the system. The highly intuitive software makes it all self-explanatory. Vend’s eCommerce feature has improved greatly in the last few years. You can set up an online store presence in just a few minutes. The eCommerce platform has many fantastic features, including the ability to edit HTML and CSS directly. Once your store is up and running, it becomes easy to manage products and customers even across multiple locations, though it does require a few more mouse clicks than some other POS systems. Vend cannot run on any browser except Google Chrome. You can use it as long as your hardware can run at least Windows 7 or Mac OS X 10.5. 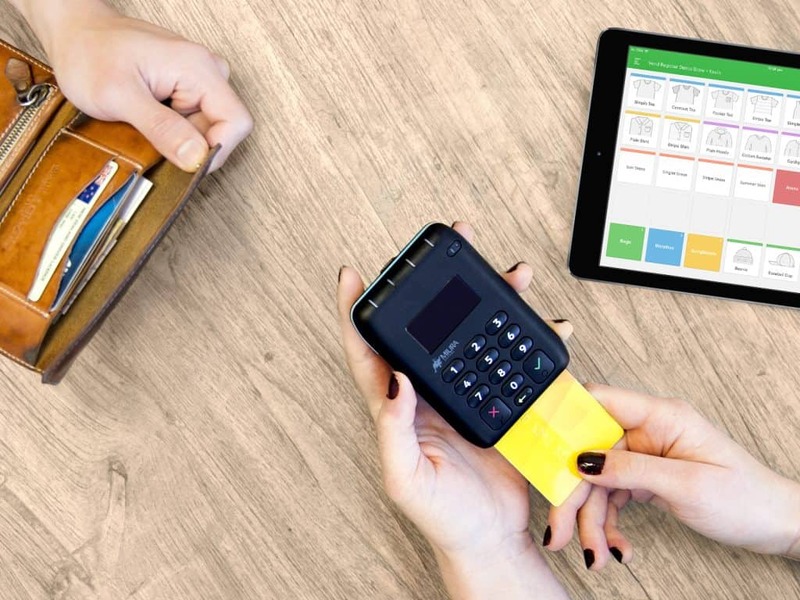 Vend offers three all-in-one POS packages: Mac, PC, and iPad. Customers can also use Star’s all-in-one mobile point of purchase (mPOP) receipt printer and cash drawer. eCommerce is only available in the Advanced and Multi-Outlet plans, and it doesn’t cost extra at these subscription levels. 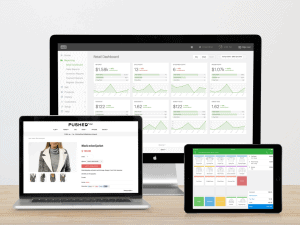 Vend offers hosting and design help through a selection of Responsive Themes, along with an integrated website builder, and the option to tie in your own domain name and live sync with your in-store inventory. The system displays properly on screens of all sizes, including that of you smartphone, tablet, or desktop computer. Because purchase orders made through the online store are automatically emailed to the admin, they are all fulfilled in real time. This POS system maintains a contact list of all your customers. You can create the list by adding each name one by one via the web console, or through mass importing from a CSV file. You can also customize certain fields of your customer list with details of your choice like residential address, phone number, email address, website, customer group, Facebook account, and Twitter ID. The system uses a loyalty program to encourage shyer customers to provide their data. You can create and send an automatic email to new customers, as soon as you enable the Loyalty program. This email contains a personalized link to a Customer Portal where customers can provide their full contact info in exchange for a loyalty bonus. This makes it faster and easier to add customers at the time of sale. You’ve got a leg up on the competition, if you give your clients an incentive to keep shopping at your store. In Vend’s model, the money spent earns rewards. You specify how much a customer has to spend before they earn a dollar in Loyalty rewards—the default setting is a dollar earned for every 50 spent, but you can adjust it as you wish. All dollars earned can be used on the next purchase. There’s no need to reach a minimum amount of points to start saving. You can view the balance from the payment screen at the time of checkout. Vend lets you add, remove, and edit inventory items easily. You can also add images of products, as well as keep track of stock levels and any special costs, taxes, or prices of certain products. Prices can be set differently, based on customer type or location, or by creating special promotions and discounts. Vend can import, create, and print barcode labels for easier inventory management. Any item can have an individualized Loyalty earning that overrides the default spent-to-earned ratio, which is especially useful if there’s a particular product you want to promote. But that's not all - Vend also offers a purchase order management feature and weekly sales data erasure. Vend can maintain multiple price books and that feature can help you in a number of ways. You can, for example, maintain separate price books, based on a specific group of customers or store location, or make them time-sensitive. In addition, if you want to have a weekend sale, you just need to create a copy of your default price book, set the timeframe during which the new prices will be active, and apply discounts across the board (or separate discounts for different products). As a result, the new parameters will replace your default pricing. Best of all, when the sale is over, regular pricing will be restored. Deputy is a cloud based all-in-one employee scheduling platform. Its other features include time & attendance, tasking and communication. 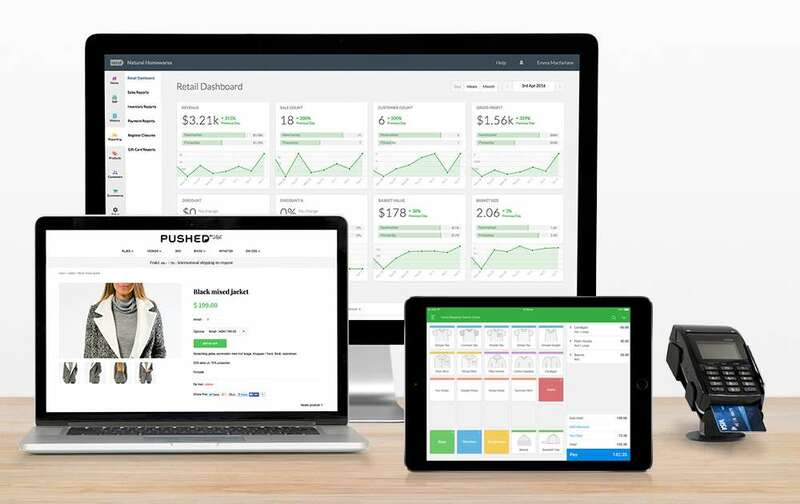 Link Deputy with Vend in just a few clicks to gain greater insight on your sales and labor metrics. You can also use Deputy to schedule staff based on Vend sales data. The reports on staff wage vs sales percentage work wonders in optimizing team performance. Deputy iPad kiosk for punch in and out is the perfect companion of the Vend iPad app. And all Vend users can try the app for 3 full months without any fee! This is a relatively recent feature, which allows you to create your own branded gift cards, avoid issuing refunds by offering store credit, and increase your payment options. The system’s app Vend Register is optimized for iPads. It comes with the option to quickly streamline and process sales, includes layaways, on-account sales, and loyalty programs, and has easily customizable quick keys. It’s very simple to look up customer information if you want to track payment history and balances. Transactions like adding store credit and parking sales are simple to process along with more basic functions like split payments and returns. Vend’s front end features quick keys which can be saved as templates. These are especially useful, if you need to increase your checkout rate. They also make it easy for you to add quick sale notes with discounts, or instructions directly to a transaction. The flexible interface allows you to divide and distribute discounts to an entire sale, or an individual product. Moreover, you can customize the receipts that you issue with your company's logo. Vend offers many integrations with third-party software programs, such as Shopify, Stitch Labs, Perkville and Timely. Shopify automatically syncs in-store and online inventory and keeps it updated in both databases, regardless of whether a purchase is made online or in-store. Any changes you make to the price and the description of a particular product in Vend are automatically reflected in Shopify. 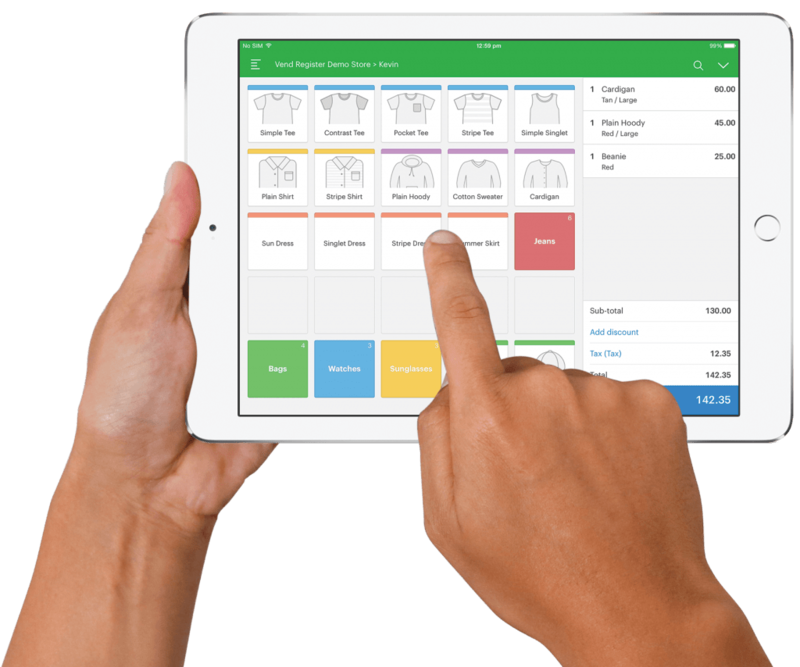 Stitch Labs integrates with the Vend POS to make stock management easier. This is a great benefit if you’re running multiple stores, working with several vendors, or if you feel that that inventory control is getting more and more challenging. Perkville enables merchants to to create an online rewards program for their customers, or design special discount coupons. By integrating with Vend, Perkville makes it possible for you to transfer and sync customer lists between the two systems. As its name suggests, Timely allows you to set up appointments with clients for the various services you offer. Sync your services, products, and customers with Timely, then move appointments back to Vend to have them rung up as sales. Vend supports in-store credit card processing via Vantiv, PayPal, and Square for all US-based merchants. Its other eCommerce options include Stripe, Authorize.Net, and Payment Express. This means you can basically integrate any processor you want into your web store. This POS is EMV-enabled, and its design allows you to also accept Apple Pay and other NFC payments. As Vend is an international company, it offers different payment processing options to its customers around the world. Canadian merchants, for example, can use Moneris Solutions, whereas UK merchants can choose from iZettle, PayPal, or Payment Express. Vend's customers in Australia have got Tyro and PayPal to choose from. 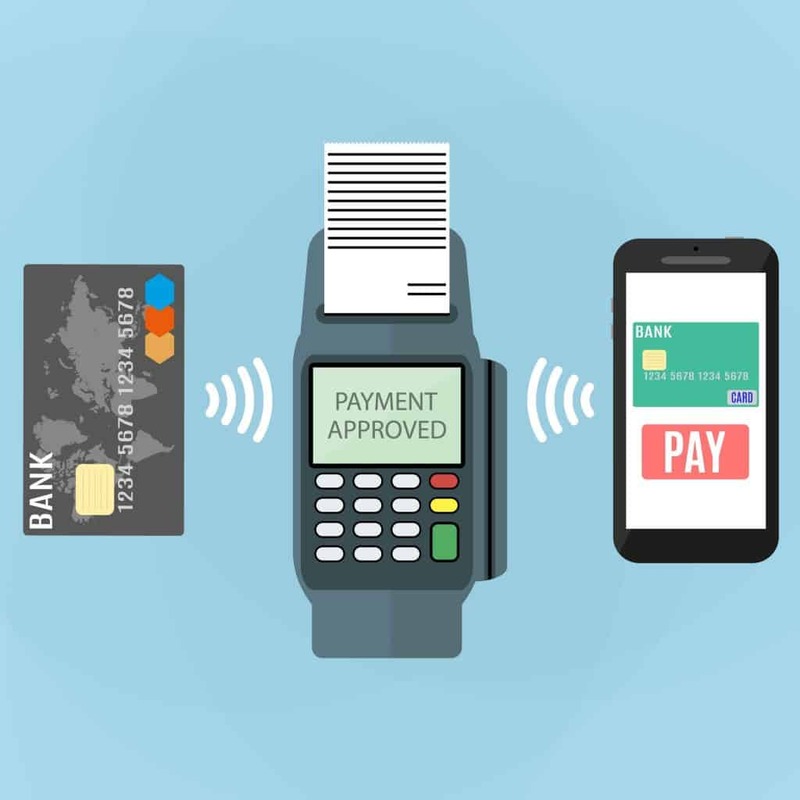 Merchants based in European countries other than the UK can choose between iZettle and Payment Express, while Smartpay is for merchants in New Zealand. Finally, iZettle is the choice of Ven's customers in all other regions of the world. The best thing is that you can also use Vend without any integrated payments – just process the sale manually within Vend by swiping your customer's credit card. Vend is one of the few POS systems that you can start using as soon as you complete the installation process, and its user-friendliness is well complemented by all the benefits of the cloud. 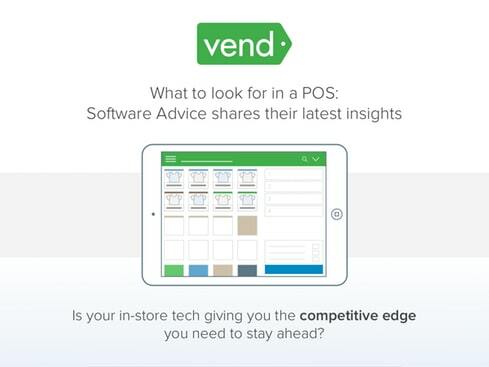 Vend is the perfect choice for all small and medium retailers that are looking for a new POS solution, because its software is very easy to learn and implement. It may not be as robust as some other retail systems out there, but it’s a reliable solution for a wide range of mid-sized businesses, which may not necessarily need inventory analysis and in-depth reports. Its pocket-friendly price also gives Vend a distinct advantage over its closest rivals.